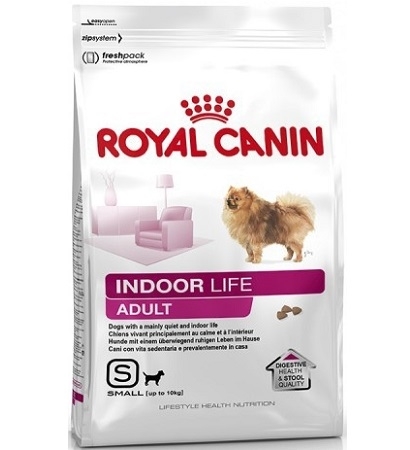 This nutritional answer has been developed for small breed dogs living mainly indoors. Itsformula supports digestive health and helps reduce faecal smell and volume thanks to highlydigestible protein (L.I.P. ), an appropriate fibre content (soluble and insoluble), and very highquality carbohydrate sources. Indoor dogs tend to be less active. Excess weight gain can affect the health of small breed dogs. Appropriate and balanced food is therefore necessary for their health. This formula helps maintain ideal body condition thanks to an adapted calorie content which meets the reduced energy needs of small breed dogs. Contains L-carnitine. Skin and coat can reflect the dog’s state of health. Appropriate food plays an important part in maintaining the quality of the skin and coat. This exclusive formula contains nutrients which help support a healthy skin and coat. It is also enriched with Omega 3 fatty acids (EPA and DHA). Small breed dogs are prone to tartar formation. Appropriate food can contribute to improving oral hygiene. The calcium chelators contained in this formula help reduce tartar formation and support oral hygiene.